While most students opt for more conventional destinations for higher education, such as Canada, the US, and the UK, there is a certain advantage to exploring comparatively less conventional destinations. The advantage of doing this is, when it comes to building your career, you tend to have a different worldview compared to your peers and rivals. This gives you an edge over others applying for the same job positions, or starting out businesses in the same sectors. 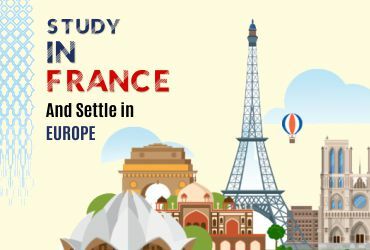 One of the less conventional, more unique study options for Indian students wishing to go abroad is France. In spite of being a small country, France has immense diversity; each town displays its own unique characteristics as you traverse the country’s lengths and breadths. The reasons to study in France are numerous. Below, we have outlined some of the most significant ones. When you compare the cost of higher education in France with that of the UK and the US, you’ll notice that the cost of studying in France is significantly lower. While private universities can appear a little pricey, public universities in France are quite affordable. The French government also offers various scholarships to international students; the Erasmus Mundus Scholarship, the Ile-de-France Masters Scholarship, and the Eiffel Scholarship, to name a few. While most courses of study are available in English in France, staying there for a year or two means you will pick up the local language. Before you know it, you will be speaking fluent French, simply by spending time with the locals in your university and your neighbourhood. France has one of the richest cultures across the globe, with an interesting historical heritage, amazing art and theatre, and great food and wine. Immerse yourself in the rich French heritage and culture during your stay, as you study in France. While you’re studying in France, you can of course travel across the country and indulge in a multitude of enriching experiences, making memories of a lifetime; what’s even better is, studying in France gives you easy, convenient access to the rest of Europe for travelling, at very affordable prices. A good French degree holds much value in the eyes of French recruiters across small and big businesses. Once you have completed your academic course in France, your chances of securing a well-paying job in a reputed French company increase significantly. Having studied in France also increases the weight of your CV internationally, in countries other than France. Sounds like your thing? The Foreign Education and Immigration Experts at Angel EduNext can help you make your dream of studying abroad in France come true.